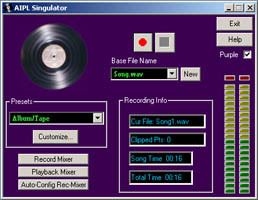 AIPL Singulator is a Microsoft Windows software song, voice or LP recorder. It transfers any analog audio to your computer in CD or higher quality audio. It will rip vinyl, a 45 single or 78 RPM album, cassette tape, DAT, Internet streaming audio, or any analog source, to your PC as WAV audio files. It automatically separates songs in real time and stops when finished. AIPL Singulator records the audio to your Windows PC as WAV files. Song, voice or LP Recorder. Rip vinyl or cassette to your PC. ...... that the music can be transferred to CDs and portable music players as individual songs. For musicians, Singulator is a time-saving tool to transfer sessions recorded on tape (DAT or reel-to-reel) to their PC for digital editing or podcasting. Others can use it to transfer voice or capture streaming audio onto their PC. Qweas is providing links to AIPL Singulator 1.5 as a courtesy, and makes no representations regarding AIPL Singulator or any other applications or any information related thereto. Any questions, complaints or claims regarding this application AIPL Singulator 1.5 must be directed to the appropriate software vendor. You may click the publisher link of AIPL Singulator on the top of this page to get more details about the vendor.